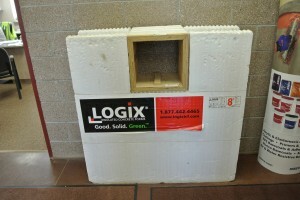 Logix ICF forms are the complete construction solution for homes and buildings. When you build with Logix ICFs you have creative freedom and better blocks with built in benefits. Logix ICFs benefits offer fast build with consistent spacing, reduced waste, and air-tight construction. These fast finishing blocks have high strength and offer excellent blow out resistance during the concrete pour. Logix ICF forms come in cavity widths from 4 inch to 12 inch. Only Logix hybrid technology offers a choice of web type, cavity thickness and panel thickness. Their knockdown forms are fully compatible and interchangeable with the solid forms, letting you gain time in the areas where the rebar spec is lighter. Logix is “net-zero” ready…..buildings that sell energy back to the grid instead of buying it. Mike Fisher built a 5,300 sf ICF home east of Dickinson and really enjoys the advantages of ICF construction. Energy efficiency, storm protection, fire protection and quiet are advantages Mike lists when discussing his home. “The wind can be blowing 70 mph and we can’t feel it or hear it in our house” according to Fisher.